The very first panel of the convention was a gathering of those behind the All Pulp website, a place on the Internet where fans can find out the latest on everything happening in the world of New Pulp. 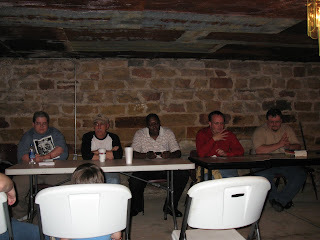 Pictured, from left to right as the panel began, is author Barry Reese, Airship 27 co-founder and writer Ron Fortier, author Derrick Ferguson, convention co-founder Tommy Hancock, and author Bobby Nash. *One of Airship 27's forthcoming releases, Challenger Storm by Don Gates, will feature art by legendary artist Michael William Kaluata! *Barry Reese's The Rook series will now be published by Pro Se Press, starting with Volume 6. *Late arrival Van Allen Plexico will be concluding his current Sentinels trilogy "Stellarax", will be released this summer. *Derrick Ferguson's first Fortune McCall collection will be out this fall from Pro Se Press. 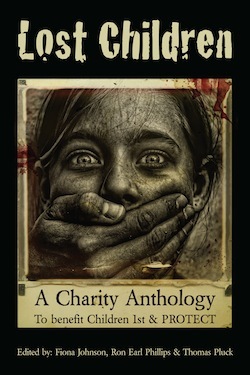 *Author Bobby Nash is so prolific, he has something coming out practically ever time he blinks. *Tommy Hancock will be writing episodes of "Hunt and Peck" for Red Panda. Also that night, scenes from current pulp adventures were performed like old time radio dramas, but unfortunately none of my photos of that event came out in a good enough quality to post here despite trying to tweak it with the Irfanview program. Another thing that happened that I personally do not have any photos of, but can be read about via the various posts on Facebook and the websites/blogs of the individual attendees, a lot of people who were able to attend the first Pulp Ark Convention wound up staying at the same motel! It wasn't planned that way, but was certainly nice to just be able to kick back each night after the day's events were over and just hang out and relax with everybody. The only other thing I must note at this point is to apologize to Pulp Ark and Pro Se co-founder Fuller Bumpers. The guy was kept so busy seeing to things along with his friend and business partner Tommy Hancock that I was never able to get him to stand still long enough to pose for a picture. Others might have, but I wasn't so lucky. Well, I think the conclusion of Day One is a nice place to end this installment. 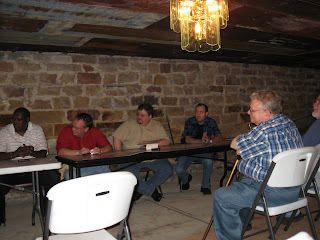 Stay tuned for more on The 2011 Pulp Ark convention.